The architecture of ROSLink is depicted in Figure 1. The ROSLink Bridge: this is the main component of the system. It is the interface between ROS and the ROSLink protocol. This bridge has two main functionalities: (1) it reads data from messages of ROS topics and services, serializes the data in JSON format according to ROSLink protocol specification, and sends to a ground station, a proxy server or a client application, (2) receives JSON serialized data through a network interface from a ground station or a client application, deserializes it from the JSON string, parse the command, and executes it through ROS. 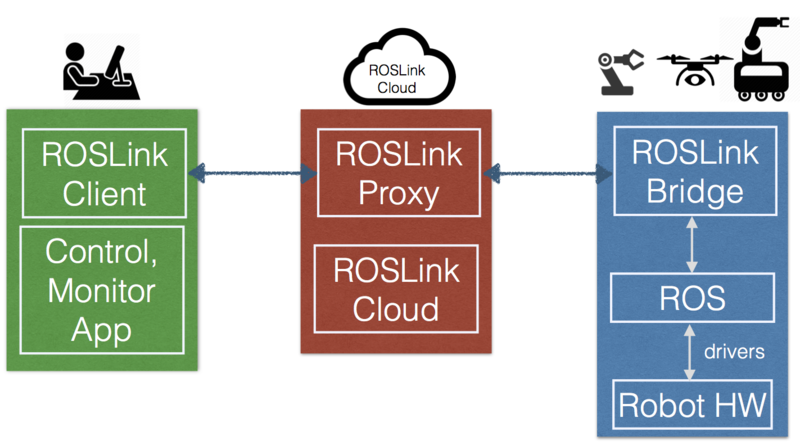 The ROSLink Proxy and Cloud: it acts as a proxy server between the ROSLink Bridge (embedded in the robot) and the user client application. Its role is to link a user client application to a ROS-enabled robot through its ROSLink Bridge. The ROSLink proxy is mainly a forwarder of ROSLink messages between the robot and user. It allows to keep the user updated with the robot status, and also forward control commands from the user to the robot. In addition ROSProxy interact with ROSLink Cloud component, to maintain and manages the list of robots and users, create a mapping between them, and perform all management functionality, including security, quality-of-service monitoring, etc. The ROSLink Client Application: it basically represents a control and monitoring application of the robot. This application is intended to monitor the status of the robot that it receives through ROSLink messages via the ROSLink Proxy from the robot. In addition, it sends commands through ROSLink messages to control the robot activities. The ROSLink Bridge consists of fully-functional ROS script written in Python, which is executed as ROS node in the client. Different ROSLink Bridge most be created for each robot which can be either real or simulated. Step 1: Identify required topics: First step before writing ROSLink Bridge is to know all the needed topics to be used to get information from or to publish on them. Also, the data structure for the message to be passed on the topic must be known. Thus, for each topic we have to specify following: topic name, Message type, publish or subscribe. Step 2: Declare a set of ROS publishers and subscribers: ROSLink Bridge is a fully-functional ROS node, so it can access all ROS topics and services. The publishers and subscribers cab be declared for all the required topics in the same way as in any typical ROS node. Step 3: Declare a set of ROS parameters: Some information about the robot or the system can be provided as parameters such as: robot name, ROSLink proxy IP, ROSLink proxy port, heartbeat message period, system ID, etc. These parameters can be assigned with some default values and also can be configured as needed from ROS launch file. Step 4: Declare ROSLink messages: Create data structure or class to represent ROSLink messages. Different ROSLink messages can have different structure, an array or a list or any other data structure can be used to represent them. The ROSLink communication protocol is based on the exchange of ROSLink messages. ROSLink messages are JSON formatted strings that contain information about the command and its parameters. To standardize the type of messages exchanged, we specified a set of ROSLink messages that are supported by the ROSLink Proxy. These messages can be easily extended based on the requirements of the user and the application. There are two main categories of ROSLink messages: (i.) State messages: these are message sent by the robot and carry out information about the internal state of the robot, including its position, orientation, battery level, etc. (ii.) Command messages: these are messages sent by the client application to the robot and carry out commands to make the robot execute some actions, like for example moving, executing a mission, going to a goal location, etc. A ROSLink message is a composed of a header and a payload. The structure of the ROSLink message header is presented in Figure 2. The roslink version is encoded as a short int on 8 bits and specifies the version of ROSLink protocol. The ros version specifies the ROS version (e.g. Indigo). The system id is an int encoded into 16 bits and specifies the ID of the robot. It helps in differentiating robots from each other at the server side. It is possible to encode the system id in 8 bits to reduce the header size, but the problem this restricts the scalability of the system to only 256 robots ID. The message id specifies the type of message received. It helps in correctly parsing the incoming message and extract underlying information. The sequence number denotes the sequence of the packet, identifies a single packet, and avoid processing duplicate packets. The key field is encoded on 24 bits and is used to identify a robot, and to map it to a user. A user that would like to have access to a robot, must use the same key that the robot is using in its Heartbeat message. Motion messages: In robot mission, it is important to know the location and odometry motion parameters (i.e.linear and angular velocities) of the robot at a certain time. Thus, a motion message containing position information of the robot should be periodically broadcast. Sensor messages: The robot needs to broadcast its internal sensor data such as IMU, laser scanners, camera images, GPS coordinates, actuators states, etc. ROSLink also defines several sensor messages to exchange these data between the robot and the user. Motion commands: For the robot to navigate in ROS, certain commands are sent to it like Twist messages in ROS, goal/waypoint locations, and takeoff/landing command for drones. The aforementioned list is not exhaustive as other types of messages can be designed based on the requirements of the users and available information from the robot.